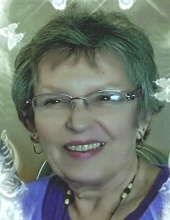 MITCHELL, Cheryl Virginia - Age 71, of Fenton, died Saturday November 17, 2018. Funeral services will be held 10AM Tuesday, November 20 at the Rock Church, 11400 S. Linden Road., Fenton. Pastor Jim Comb officiating. Visitation will be held 4PM-8PM Monday at Sharp Funeral Homes, Linden Chapel, 209 East Broad Street, Linden. Visitation will also be held 9AM until time of service at the church on Tuesday. Cheryl was born in Huntsville, Ontario on May 20, 1947 the daughter of the late Robert Sandwick and Marvel Ada (McLennan) Chamberlain. She married Phillip Jason Mitchell in Fenton on March 3, 1979. Cheryl was a member and volunteer at the Rock Church. She enjoyed gardening, sewing, reading, writing and blue grass music. Surviving are: husband of 39 years, Phillip Jason Mitchell of Fenton; children, Phillip (Deb) Mitchell Jr. of Fenton, Deborah (Kevin) Beckman of TN, Randall (Jennifer) Mitchell of Fenton, Laura (Brett) Bradford of FL, Pamela (Chris) Weymers of Mt. Morris; 9 grandchildren, 7 great grandchildren. Cheryl is also survived by her siblings, Phyllis (Roy) Ripley of Gaines; Kenneth (Maggie) Chamberlain of Grawn, MI; Nola (Terry) Keesler of Fowlerville, Donna (Ron) Jones of Brighton, Shelly (Tom) Bauer of Milan and many nieces and nephews. Tribute may be posted on the obituaries page of www.sharpfuneralhomes.com. To send flowers or a remembrance gift to the family of Cheryl Virginia Mitchell, please visit our Tribute Store. "Email Address" would like to share the life celebration of Cheryl Virginia Mitchell. Click on the "link" to go to share a favorite memory or leave a condolence message for the family.